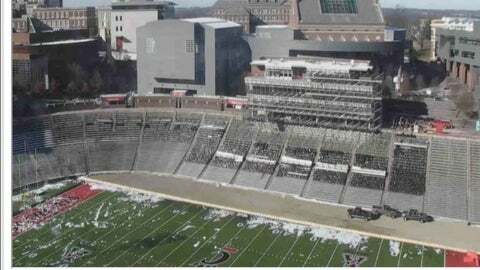 UC Athletics has a camera recording all of the action as Nippert Stadium undergoes a facelift. Want to see how the renovation at Nippert Stadium is going at any time of day? The UC Athletics has you covered. A construction camera has been put on the roof of the Richard E. Lindner Center to allow fans to keep tabs on the work being done at the Nippert site, where the Bearcats have played since 1901. After playing next season in downtown Cincinnati at Paul Brown Stadium, the Bearcats will return to Nippert in 2015. For more information about the project and to access the updated renderings, see http://www.gobearcats.com/nippert.